Who, Me? Part 7: Emerging From Their Chicagoland Crypt, It’s Count And Countess Gregula! Later on that first day at the convention, my family had to practically tear me away from Horror Host Alley in order to bring me into the massive MaskFest room. Now, I have to admit, I did see some amazing masks there, and I really did enjoy exploring that room! I met two of the Killer Klowns from Killer Klowns From Outer Space, and also saw, but didn’t get a chance to speak to, the male and female leads from the film. The Klowns were both very kind, and were more than willing to take a picture with me when I bought their autographs! They also both confirmed something I had read on the Internet and had been wondering about for a while: Apparently, the Chiodo brothers have been attempting for a few years… to make a sequel to Killer Klowns From Outer Space! I’ll be on the lookout! Another highlight of the MaskFest room was The Late Dr. Lady’s table. Recognizing his name from The Daves’ blog, I went over and had a very nice talk with him as I perused the surprisingly varied merchandise he was selling. My family ended up buying a couple of funny-yet-fully-functional weekly pill cases, each of which bore the warning, “DANGER: MAY CONTAIN EXPERIMENTAL MONSTER TRANSFORMATION PILLS.” We also bought a Horror Hotel CD. Having made our rounds around the MaskFest room, I begged to be allowed to return to Horror Host Alley. After receiving permission, I bolted back to the room, marveling once more at how the room just kept becoming more and more elaborate as the day went on and more and more horror hosts arrived. As far as I could tell at the time, Ms. Monster had still not yet made her entrance. 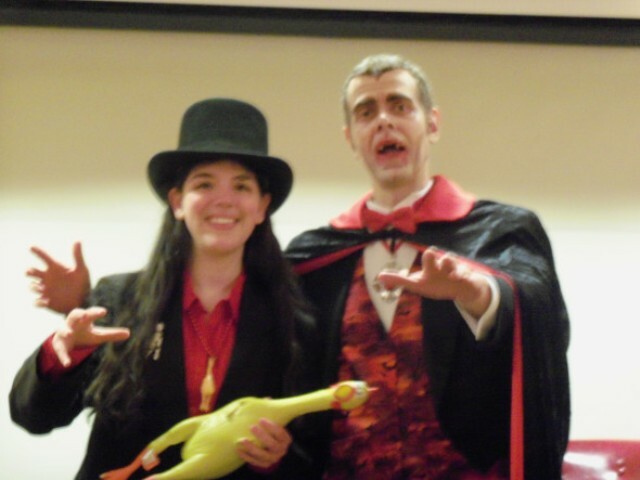 But even before she arrived, I still had one horror host left on my list to meet: Count Gregula. Though I had been actively looking around for him all day, I had seen absolutely no sign of him or the Countess. Well, that was about to change. My mother was with me this time as I re-entered the room, and, looking to my left, I suddenly saw him, conversing with Professor M. Balmer! I wasted no time in rushing over there, as if I were afraid he would just as suddenly disappear! “For me?” Being on the receiving end of this kind of comment really threw me for a loop. Later on that day, he said that his first thought when I said that was, “Do I owe you money or something?” For some reason, he was really genuinely surprised that someone was actually looking for him at the convention! Count Gregula and Professor M. Balmer! One of the most fascinating parts of the convention for me was witnessing horror hosts from across the country, all of whom were so different, actually interacting with each other. They really are like one big, happy family! At any rate, Count Gregula apologized for not seeing my e-mail that I had sent him a few days before (As if he really had to! ), and he was very kind (and patient) as I explained my project to him. He agreed very readily to be interviewed on camera by me that very night, so that I could get him on film while he was still in costume! I met the Countess a short while after meeting Count Gregula, and she was just as kind and fun to talk to! We conducted his interview right after the deeply moving Zacherley tribute had concluded Saturday night, and he was very informative and entertaining! Here’s Count Gregula right after the interview. See? He’s none the worse for wear! Both Count and Countess Gregula were great people to meet and talk to, and were certainly worth the search to actually find them! 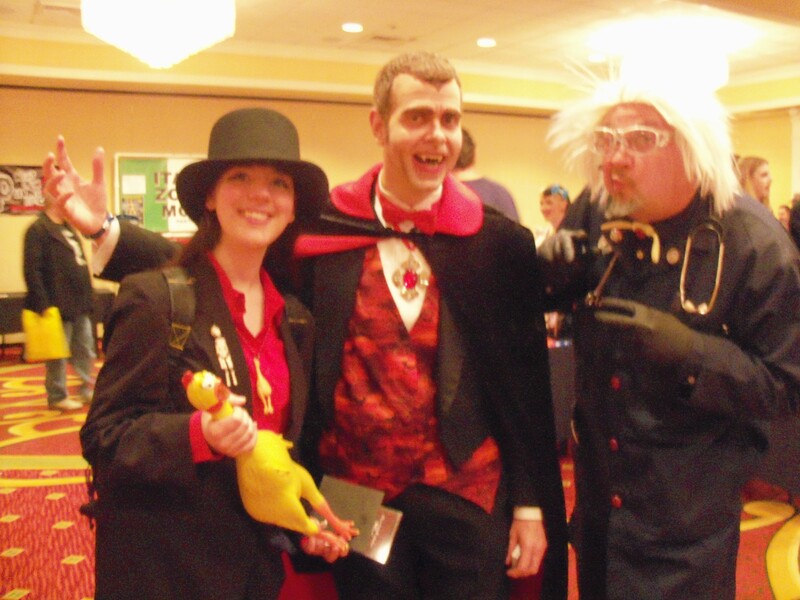 This entry was posted in Horror Hosts and tagged COUNT GREGULA, HORRORHOUND WEEKEND. Bookmark the permalink. ← Can this PLEASE Be the Final, Final Destination?